While more African Americans are going to college, new research from the Georgetown University Center on Education and the Workforce (Georgetown Center) finds that they are overrepresented in majors that lead to low-paying jobs. African Americans: College Majors and Earnings notes that while this reality reflects personal choice, it also reflects the fact that African American students are concentrated in open-access and four-year institutions that often offer a more limited menu of major choices. African Americans comprise 12 percent of the US population, but they are underrepresented in the number of degree holders in college majors associated with the fastest-growing, highest-paying occupations—STEM, health, and business. African-American students account for 7 percent of STEM majors. And even though they account for 10 percent of all health majors, they are clustered in the lowest-earning major: health and medical administrative services. The Georgetown Center analysis of 137 detailed majors reveals that only 6 percent of African Americans with a Bachelor’s degree majored in pharmacy and pharmaceutical sciences and administration, the major with the highest median earnings: $84,000. Twenty percent majored in human services and community organization, which has the second lowest median earnings at $39,000. The major group with the highest median earnings for African Americans with a Bachelor’s degree is architecture and engineering ($66,206), yet only 5 percent chose this major group. Comparatively, 12 percent of African Americans are concentrated in psychology and social work, the major with the lowest median earnings for African Americans with a Bachelor’s degree ($42,107). African-Americans disproportionately major in intellectual and caring professions such as psychology and social work, where low incomes do not reflect their years of higher education. 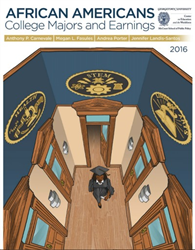 The full report of African Americans: College Majors and Earnings is available at cew.georgetown.edu/africanamericanmajors. The Georgetown Center’s Initiative on Equity, Diversity and Inclusion seeks to narrow the information gap on career earnings for minority students by informing the practice of school counselors and educational advocates and increasing access to information about majors, degrees, unemployment and earnings. For more information visit: cew.georgetown.edu/initiative/equity.